Time for one of my favorite events — the Shopbop Event of the Season!! This post about the Shopbop Event of the Season for September 2018 contains affiliate links. Please read this blog’s disclosure post for more info. Do you Shopbop? It’s one of my favorite retailers. With quick shipping, a very well-selected variety and a great return policy, I delight in so many of my Shopbop buys! 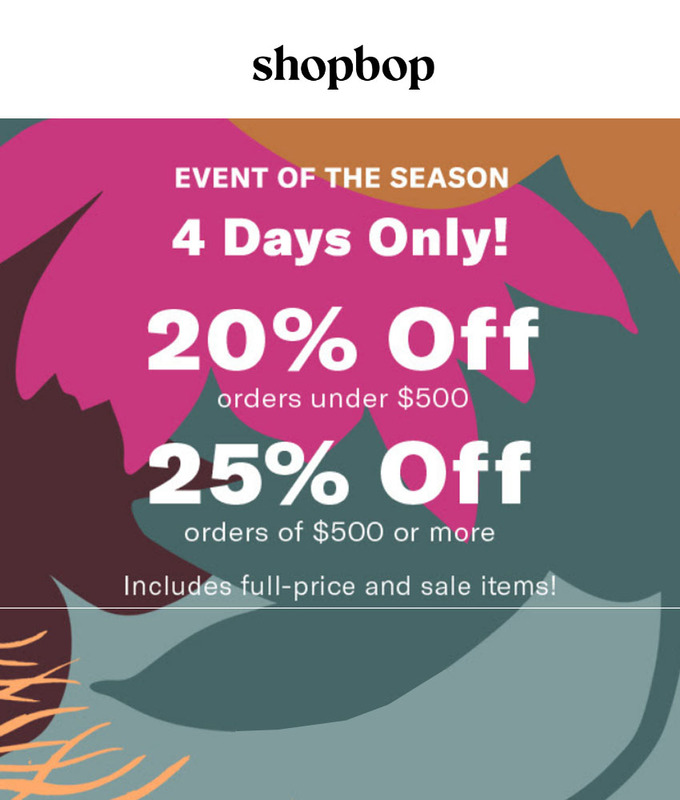 This week the Shopbop Event of the Season for September 2018 is here! You can take 20% off your order up to $499, and 25% off orders of $500+. Use code STOCKUP18. I’ll share my picks and then you let me know what you’re liking in the comments! I find Shopbop a reliable destination for dresses. I recently found an engagement party dress there and often find work frocks at Shopbop too. During the Shopbop Event of the Season for September 2018 the dress selection is a fantastic mix of work-ready, party-ready, weekend-ready and just plain spectacular! The Alice + Olivia Virgil Dress ($350 + up to 25% off) above is a fine example of versatility. It’s long enough for work, simple enough for weekend (throw a denim jacket over it) and elegant enough for date night or a party. With such limited closet space in our current apartment I treasure pieces like this! Of course that doesn’t mean I’m not also eyeing some of the more specialized pieces. The See by Chloe Ruffle Sleeve Dress ($315 + up to 25% off) has sleeves that do volume in measured amounts. Sea’s Greta Sleeveless Pintuck Dress ($395 + up to 25% off) is shapeless on its own but has such beautiful detailing. With the right blazer, cardigan or jacket over it the dress’s beauty will shine while it defines my curvy shape. From Tory Burch’s Tilly Dress ($345 + up to 25% off) to J.O.A.’s Floral Midi Dress ($89 + up to 25% off), I’m swooning over many dresses in this fantastic Shopbop promo! Here are my dress picks. When it comes to jackets there are few shapes I dislike. I love motos. Peacoats? I adore them. I swoon over long car coats or cigarette coats. A blazer makes any work outfit look extra crisp. And in my opinion, one can never have too many drapey coats. Many of the heavier items in the Shopbop Event of the Season for September 2018 straddle the line between sweater and coat. Perfect for these early days of Fall! 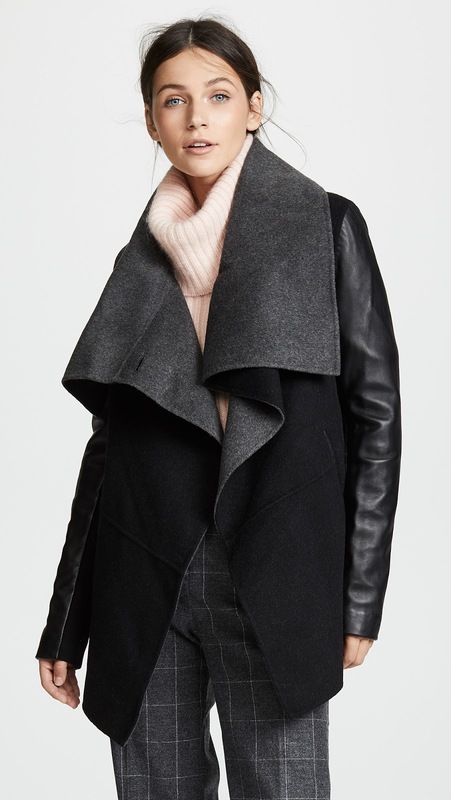 The Mackage Vane Coat ($750 + 25% off) is calling to me! Though I’m torn between it and the Michi Dust Wrap Jacket ($255 + up to 25% off), a less extreme version of the same styling idea. Do you have a preference between these two? Soft cashmere turtlenecks. Stylish boatnecks. Classic v-necks. Leather, vegan leather and suede. You’ll find them all in my picks! If your closet is feeling pretty set with clothing already, may I suggest taking a look at the many gorgeous bags included in the Shopbop Event of the Season for September 2018? By no means is the selection an exhaustive representation of all the bags Shopbop sells. That said, there are so many delights included in the promotion! 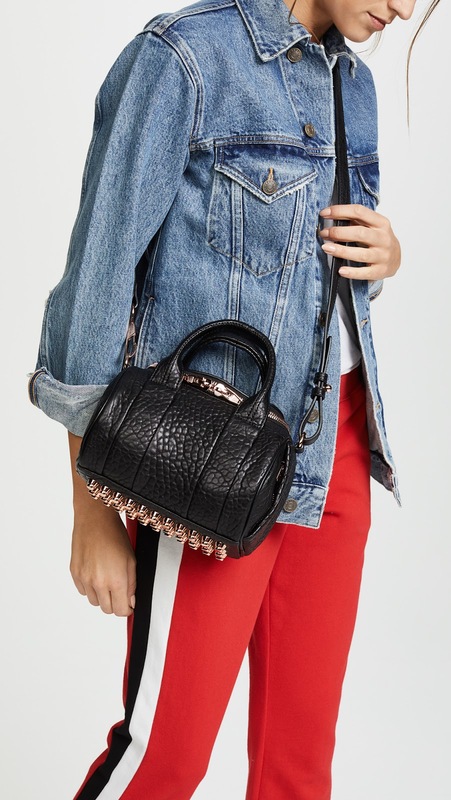 I probably always mention the Alexander Wang Rockie Mini Bag ($650 + 25% off, shown above in rose gold hardware, also in silver hardware) because it’s one of my favorite bags! It’s been a durable classic in my closet. The shape amuses me and it holds much more than its small size belies. Alexander Wang has many cute bags in the promo — the Mini Marti Backpack ($995 + 25% off) another I love. Shopbop normally edges towards trendy bags. Its Event of the Season is stocked with on-trend choices that have staying power, from the 3.1 Phillip Lim Pashli Satchel ($495-$750, red is my favorte) to Madewell’s many bags. I also love how Shopbop shows Madewell’s drawstring totes both strung in and left loose! This practice truly illustrates how those bags are two styles in one. It’s rare to score these bags at such deals in this wide of a color and size variety. Below, my picks. You have through September 29th to shop the Shopbop Event of the Season for September 2018. Note that sale items are also included in this promotion!! Here it comes — my curated boutique of picks! Skip the overwhelming selection and shop the best items in the the Shopbop Event of the Season for September 2018, below. This is one of my favorite sales also. It is where I stock up on boots (Stuart Weitzman) and other pricey items – this year veronica beard possibly along with some others. Regarding the jackets – If there was no such thing as a budget or prices, I like the Mackage one due to the leather sleeves which I prefer over the fabric. The price difference, however, is not inconsequential so if you like the Michi jacket as well, I say go for that. I agree Shopbop has most all of the brands I love in one spot! Makes shopping very convenient. And these 25% off promos always come at the right time, months before these goods will go on sale anywhere else. I have to ask a silly question – what exactly is Shopbop? Short answer: it's an online-only store (now owned by Amazon) that has a highly curated selection of midrange high-end goods. VERY good selections. Longer answer: Originally Shopbop was the online store for a Wisconsin-based storefront (called Bop I believe, but I'm not 100% on that). The site was quickly found by fashion editors who loved the small but well-done selection of goods. Think of Shopbop like the "contemporary" department in a midrange department store. It's got lots of brands we love (AG, J Brand, Rebecca Taylor, Rebecca Minkoff, BB Dakota, etc) and does a great job of pulling together cohesive fashion stories each season. They were purchased by Amazon a few years ago. I do like Shopbop but hate that they are owned by Amazon. They have almost ruined Whole Foods for me. Yes, similarly I decided to end my partnership with Amazon Fashion for now as I'd like to back off and see where Amazon is going. I've enjoyed working with them and will be watching to see what develops, and I'm sure I'll still post about them from time to time. And Roxy – why did you end your partnership with Amazon, and where do you think that Amazon is going? As for where I think Amazon is going they're basically the next Sears or Walmart. The place to go for practically anything you need. And all the positive and negative that comes along with that. I think ShopBop's prices are mind blowingly high, even on sale. There are some truly unique and pretty styles on the site and I love browsing through, so I'm hoping they do bring in some more midpriced brands in the future. I can appreciate that Guest! Don't worry, I'm not going all high-end on the blog, I like mixing in some higher-end sales with the rest of my content because it's a good mix of stores I purchase from. Thanks, Roxy! I will check it out. Joie is also having a sale – 25% off. Also today, Anthropologie sent out a preshop link for October! And it's very…boring. I got that pre shop link and didn't even look. I wasn't expecting to see anything I would like. Their September print catalog wasn't even worth saving and truly the worst catalogue they have ever issued IMO. I honestly said to myself: "Are you kidding me? Does anybody think this is good?". A stark contrast to the days where the delivery of an Anthro catalog was possibly the highlight of the day and the beginning of desire. Your Shopbop link did give me that though, thank you. I love the jacket choices particularly. Jess, that Sherpa Jacket is in my shopping cart! Wait, I am wrong it is the Marrakesh Faux Fur Aviator that is in my cart. But I like the Sherpa that you got also. I love that one too! In fact, I pretty much love all Marrakech, I have two other lightweight jackets from them and they are so stylish and comfortable. Wow! How boring an Anthro could be?? You're welcome Nam! And I agree. I totally agree on the pre shop. I did look just to see but nothing. A couple of cheaply made plaid dresses that might be interesting on sale at $50 but that is all. Gives me money to spend elsewhere. On another note, is Revolve independent or are they owned by another retailer? They have stepped it up in recent years. Younger overall (my daughter purchases dresses there) but they have some brand in sweaters i like. Revolve is independent. I'm not a big fan of them — they are very whitewashed and ALL of their ambassadors are homogeneous. Additionally they've been embroiled in more than one body negativity oopsie. Should I take an aspirin and call the doctor in the morning? I actually kind of like the Oslo sweater coat. It’s a very rare moment when I don’t want to use the plant face emoji 🤦‍♀️ when I see an Anthro item. The fit looks bad though and I am sure I am going to hate it as soon as I touch it. I was recently at Santana Row for a little shopping and I thought I’d venture into the Anthro store. The quality was just so sub par it was terrible. Just yuck. I liked that one too! I also liked the Loveliest Landscape sweater; it is sooo soft in person and has a vintage Anthropologie feel. I had a link to another one pop up recently on the home page…something about shapes/balancing tops and bottoms or proportions or something like that…but it disappeared and never popped up again. It's interesting that they're taking some kind of stab at content marketing, but I don't understand their overall approach. Unless the one I linked to above is the first one (?? ), there's no archive of previous Style Notes (at least none that I can find?) and no dedicated section on the site. I did notice this Soleil, mostly because as you probably know I love composing outfits using multiple tones of the same color! It's a very sophisticated way to assemble outfits. I like all of the looks, though they don't initially strike me as very Anthropologie. Like you I've never seen this before — I don't know if they decided to kick it off in media res as though they'd done these before or what. Just looked at the October offerings at Anthro……Eh (shrugs shoulders). That's my response. Has anyone ever used Afterpay? My biggest complaint is that it's TOO MUCH. Who needs 15 pages of new arrivals every 3 weeks or so? It's completely overwhelming and shows a lack of curation happening. And menswear as womenswear? Fuh. I don't mind it but it's a trend that's so overdone. How about womenswear as womenswear? That'd be novel! For those of you who get emails from Sundance, they sent one for 15% off and free shipping for over $100. Just ordered a shirt I have been eyeing for over a year! And the shirt was $98 and I chatted with customer service to ask if I could use it with that top even though I realized it did not meet the minimum, and the customer service rep said of course:) I have only purchased a few things from them but the quality has been top notch and the item as pictured and the fit as described. Thank you for this soulrebel! Was there a specific code to use? For whatever reason I never get emails from Sundance even though I've signed up for them. No, link from email but if you chat with customer service they will definitely take care of you.